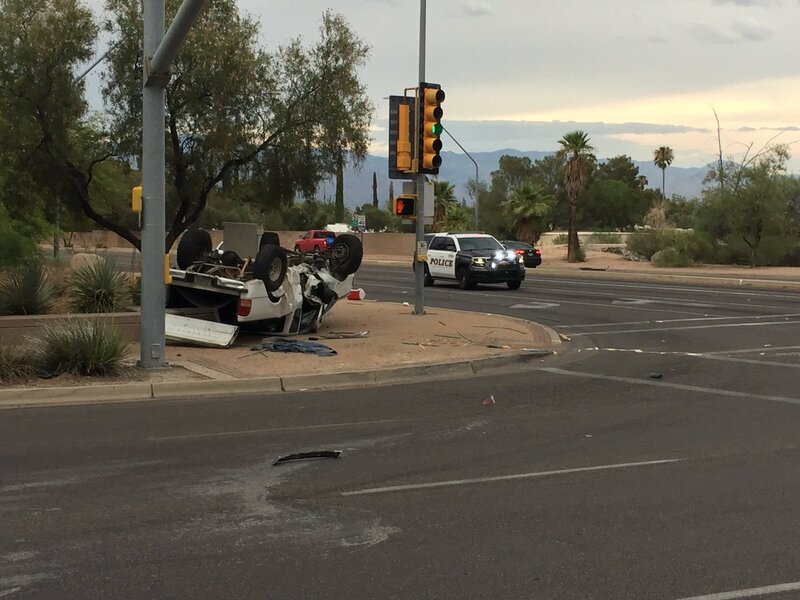 Tucson, Arizona—A man is in the hospital with life-threatening injuries as the result of a hit-and-run accident Saturday evening at about 6:00 p.m.
Tucson Police and Fire Departments responded to a report of a collision at the intersection of Golf Links and Swan roads. Upon arrival, emergency responders found an unidentified man inside an overturned white Ford Ranger on the northwest curb of the intersection. Rescue efforts required extricating the driver, who was then transported to a local hospital with life-threatening injuries. With information from various sources, accident investigators determined the injured driver had been westbound on Golf Links Road as he approached the intersection at Swan Road on a green light. A maroon Dodge Ram truck driven by Francisco Santos Dorame, age 36, approached the intersection from the opposite direction. Mr. Dorame cut off several vehicles in order to turn north onto Swan Road, broad-siding the Ranger in the process. He then fled the scene. Tucson police accident investigators placed information about the suspect vehicle on social media and provided the same to media outlets. This produced multiple leads about the vehicle’s location. Mr. Dorame turned himself in when approached by police. He was arrested and booked into Pima County Jail on felony charges of aggravated assault with serious physical injury, aggravated assault with a deadly weapon and leaving the scene of an injury accident.